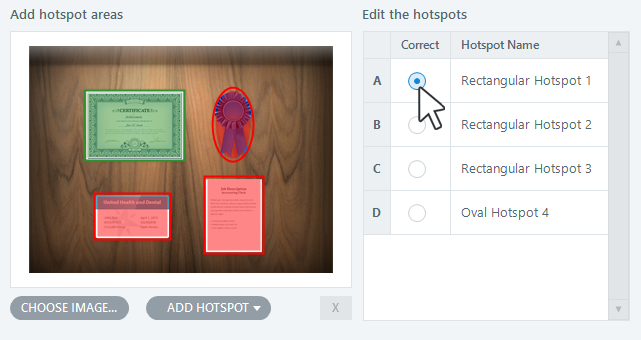 Articulate Storyline's freeform hotspot question lets you build an interactive assessment with one or more hotspots. It can be graded or ungraded. In Story View, right-click anywhere in the workspace and choose New Slide. In Slide View, right-click anywhere in the Scenes panel on the left side of the screen and choose New Slide. When the Insert Slides window opens, select the Quizzing tab on the left. Click the Freeform tab at the top of the window and select Hotspot. A new hotspot question will open in Form View. 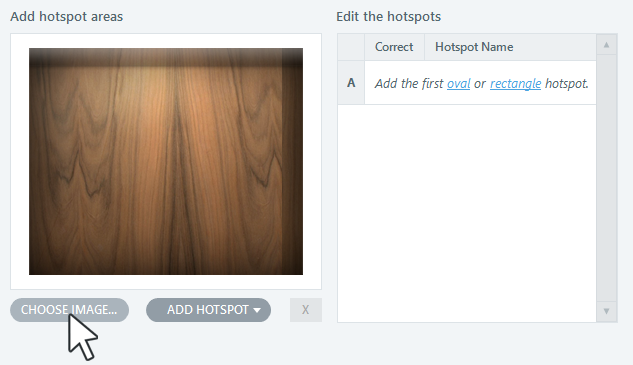 Proceed to the next steps to add an image and define your hotspots. Browse to the picture you want to use. The image will appear in the interactive preview area above the Choose Image button (and also in the preview thumbnail on the right side of the screen). If you change your mind about the picture you selected, click Choose Image again to browse for a different picture. Tip: You can also swap out the background image when you're in Slide View. Just right-click the image on the slide and select Change Picture. 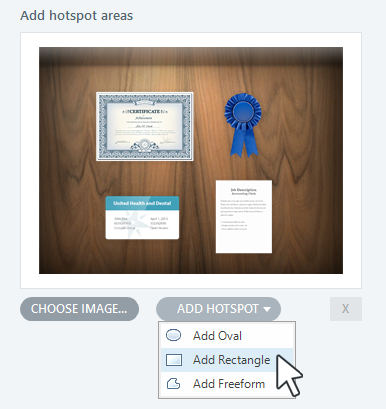 To add a hotspot, click Add Hotspot and choose one of the shapes. Draw the hotspot on the interactive preview area above the Add Hotspot button. To move a hotspot, just drag it with your mouse in the interactive preview area. To delete a hotspot, click the X below the interactive preview area or press the Delete key on your keyboard. If your hotspot question will be graded, mark the radio button in the Correct column that corresponds to the right answer. Go to the Question tab on the ribbon and use the Submit drop-down to choose how your hotspot question will be submitted for evaluation. 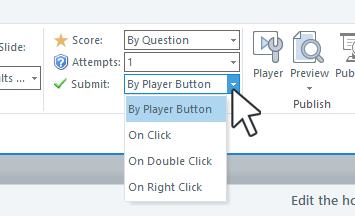 Tip: The default option, By player button, means learners must click the built-in Submit button on your course player. 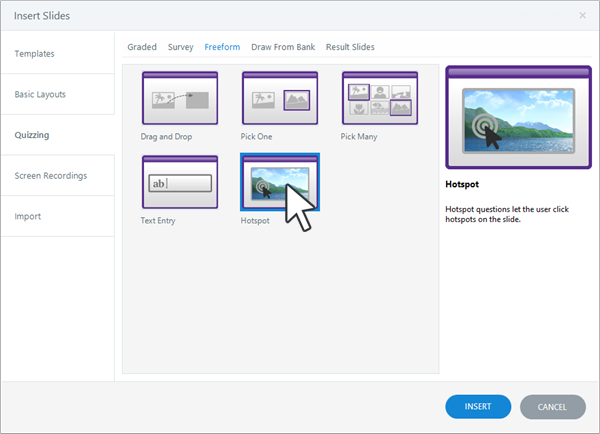 After creating a freeform hotspot question, you can customize several of its attributes, including feedback, branching, score, number of attempts, and whether learners are required to answer it or allowed to skip it. To learn how, see Working with the Question Editor. Can I Convert a Freeform Question into a Non-Question Slide? Yes. It's easy—Just go to the Insert tab on the ribbon and click Remove Freeform. When you remove freeform functionality from a question, it becomes a standard content slide. Text, images, hotspots, and other objects remain intact. Only question-related properties, such as score and feedback, are removed.